At around 1:30 today, our vet came to the house and released our beautiful Tim from his suffering. Tomorrow is my birthday. We so sorry to read about dear Tim. Our friends Chuckie and Thomas wlil be there to greet him on the bridge. I am so so sorry ..
We are all so sorry about the loss of Tim. Our momma is having furry many of our furends go to Heaven this week and she is cryin' alla' the times. We know that you did everything for him and that the decision was not an easy one. Loving beings that have shorter life spans than humans can be a furry miserable exPURRience sometimes. We saw at Lilacs and Cats that your sweet Tim went to the Rainbowbridge. Please accept our gentlest purrs. This came so fast it must be even harder to believe. He's free from pain and suffering now. JC led me to your blog. I am the mother of 2 cats, Tigger (age 13) & Bambi (age 4). Tigger's 2 yrs. younger sister Callie 4 yrs. ago at a 6 1/2 (sudden heart attack). My condolences to you & your family on Tim. We saw over at Lilacs and Cats that your Tim went to the Rainbow bridge. We are giving our condolences to you. We lost our beloved Dandelion 2 years ago. So sorry to hear about your loss. Our prayers and purrs are with you. We are so very sorry for your loss. Take heart in the fact that Tim is now healthy, and you will see him again one day. We came over here from JC's blog to say we are so sorry to hear that your precious Tim has gone to The Bridge. Take peace in knowing that he left you knowing the TRUE meaning of love! Our thoughts and purrayers are with you at this difficult time. Our beloved Scooter(RIP) most likely met him there. We're so sorry for your loss...we know that heavy feeling. We heard about Tim...and are so sorry. It is never easy to lose a beloved friend. Many purrs and prayers are coming your way. I am so sorry about Tim. My heart goes out to you and your family. We are very sorry to hear about the loss of your Tiny Tim. Please know that you are in our thoughts during this very sad time. We are sure our Cal, who left for the bridge in March, was there to greet him. we are saddened by the news of tiny tim's passing. we are sending comforting purrs to your home. We're so sorry to hear about Tiny Tim. I read about Tiny Tim on the Cat Blogosphere. I am so sorry for your loss. It's just rotten that it came the day before your birthday. 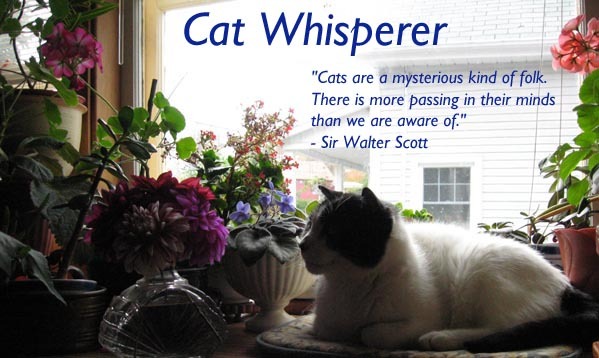 Take comfort in knowing that he is running free at the Rainbow Bridge, having a wonderful time with all the other Bridge kitties and waiting patiently for you. We just came over from the CB...heard about your Tiny Tim. We are so sorry for your loss. Purrs from all of us. We are so sorry to read of Tiny Tim's passing. We send you all love and rumbly purrs. My sisters Sascha, Gracie, Zoe & I are all so sorry to hear about Tiny Tim, it made all of our whiskers weepy and we're thinking of you. Anya, I am so, so sorry. I know how much your kitties mean to you. I lost my heart-kitty Zoë on Sept. 30, 2007. I hope she gave your wonderful Tim a warm welcome to Catnip Heaven. Felines are so precious! My thoughts are with you. We didn't know Tim, but we are sorry he had to leave so soon. Warm purrs and tail wags. Anya, I am sorry about poor Tim. This is no doubt one birthday that will be hard to forget. This is my first visit but I've bookmarked your blog so I can come back to see you. I am sending you some hugs ... I feel your sadness.